Michelin Guides (French: Guide Michelin [ɡid miʃ.lɛ̃]) are a series of guide books published by the French tyre company Michelin for more than a century. The term normally refers to the annually published Michelin Red Guide, the oldest European hotel and restaurant reference guide, which awards up to three Michelin stars for excellence to a select few establishments. The acquisition or loss of a star can have dramatic effects on the success of a restaurant. Michelin also publishes a series of general guides to cities, regions, and countries, the Green Guides. In 1900, there were fewer than 3,000 cars on the roads of France. To increase the demand for cars and, accordingly, car tires, car tire manufacturers and brothers Édouard and André Michelin published a guide for French motorists in 1900, the Michelin Guide. Nearly 35,000 copies of this first, free edition of the guide were distributed; it provided useful information to motorists, such as maps, tire repair and replacement instructions, car mechanics listings, hotels, and petrol stations throughout France. Four years later, in 1904, the brothers published a guide to Belgium similar to the Michelin Guide. Michelin subsequently introduced guides for Algeria and Tunisia (1907); the Alps and the Rhine (northern Italy, Switzerland, Bavaria, and the Netherlands) (1908); Germany, Spain, and Portugal (1910); Ireland and the British Isles (1911); and "The Countries of the Sun" (Les Pays du Soleil) (Northern Africa, Southern Italy and Corsica) (1911). In 1909, an English-language version of the guide to France was published. During World War I, publication of the guide was suspended. After the war, revised editions of the guide continued to be given away until 1920. It is said that André Michelin, whilst visiting a tire merchant, noticed copies of the guide being used to prop up a workbench. Based on the principle that "man only truly respects what he pays for", Michelin decided to charge a price for the guide, which was about 750 francs or $2.15 in 1922. They also made several changes, notably listing restaurants by specific categories, adding hotel listings (initially only for Paris), and removing advertisements in the guide. Recognizing the growing popularity of the restaurant section of the guide, the brothers recruited a team of inspectors to visit and review restaurants, who were always anonymous. : "Exceptional cuisine, worth a special journey" (Une des meilleures tables, vaut le voyage). 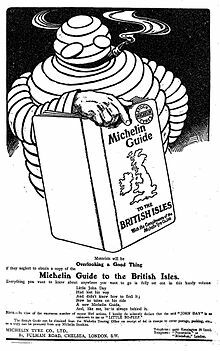 In the early post-war years the lingering effects of wartime shortages led Michelin to impose an upper limit of two stars; by 1950 the French edition listed 38 establishments judged to meet this standard. The first Michelin Guide to Italy was published in 1956. It awarded no stars in the first edition. In 1974, the first guide to Britain since 1931 was published. Twenty-five stars were awarded. In 2005, Michelin published its first American guide, covering 500 restaurants in the five boroughs of New York City and 50 hotels in Manhattan. In 2007, a Tokyo Michelin Guide was launched. In the same year, the guide introduced a magazine, Étoile. In 2008, a Hong Kong and Macau volume was added. As of 2013, the guide is published in 14 editions covering 23 countries. In 2008, the German restaurateur Juliane Caspar was appointed editor-in-chief of the French edition of the guide. She had previously been responsible for the Michelin guides to Germany, Switzerland, and Austria. She became the first woman and first non-French national to occupy the French position. The German newspaper Die Welt commented on the appointment, "In view of the fact German cuisine is regarded as a lethal weapon in most parts of France, this decision is like Mercedes announcing that its new director of product development is a Martian." Red Guides have historically listed many more restaurants than rival guides, relying on an extensive system of symbols to describe each one in as little as two lines. Reviews of starred restaurants also include two to three culinary specialties. Short summaries (2–3 lines) were added in 2002/2003 to enhance descriptions of many establishments. These summaries are written in the language of the country for which the guide is published (though the Spain and Portugal volume is in Spanish only) but the symbols are the same throughout all editions. The French chef Paul Bocuse, one of the pioneers of nouvelle cuisine in the 1960s, said, "Michelin is the only guide that counts." In France, when the guide is published each year, it sparks a media frenzy which has been compared to that for annual Academy Awards for films. Media and others debate likely winners, speculation is rife, and TV and newspapers discuss which restaurant might lose, and who might gain a Michelin star. The Michelin Guide also awards Rising Stars, an indication that a restaurant has the potential to qualify for a star, or an additional star. Since 1955, the guide has also highlighted restaurants offering "exceptionally good food at moderate prices", a feature now called "Bib Gourmand". They must offer menu items priced below a maximum determined by local economic standards. Bib (Bibendum) is the company's nickname for the Michelin Man, its corporate logo for over a century. In 2014, Michelin introduced a separate listing for gastropubs in Ireland. In 2016, the Michelin Guide for Hong Kong and Macau introduced an overview of notable street food establishments. Additionally in 2016, the Singapore guide introduced the first Michelin stars for street food locations, for Hong Kong Soya Sauce Chicken Rice and Noodle and Hill Street Tai Hwa Pork Noodle. All listed restaurants, regardless of their star- or Bib Gourmand-status, also receive a "fork and spoon" designation, as a subjective reflection of the overall comfort and quality of the restaurant. Rankings range from one to five: one fork and spoon represents a "comfortable restaurant" and five signifies a "luxurious restaurant". Forks and spoons colored red designate a restaurant that is considered "pleasant" as well. Restaurants, independently of their other ratings in the guide, can also receive a number of other symbols next to their listing. Coins indicate restaurants that serve a menu for a certain price or less, depending on the local monetary standard. In 2010 France, 2011 US and Japan Red Guides, the maximum permitted "coin" prices were €19, $25, and ¥5000, respectively. Interesting view or Magnificent view, designated by a black or red symbol, are given to restaurants offering those features. Grapes, a sake set, or a cocktail glass indicate restaurants that offer, at minimum, a "somewhat interesting" selection of wines, sake, or cocktails, respectively. The Michelin Green Guides review and rate attractions other than restaurants. There is a Green Guide for France as a whole, and a more detailed one for each of ten regions within France. Other Green Guides cover many countries, regions, and cities outside France. Many Green Guides are published in several languages. They include background information and an alphabetical section describing points of interest. Like the Red Guides, they use a three-star system for recommending sites ranging from "worth a trip" to "worth a detour", and "interesting". Pascal Rémy, a veteran France-based Michelin inspector, and also a former Gault Millau employee, wrote a tell-all book published in 2004 entitled L'Inspecteur se met à table (literally, "The Inspector Sits Down at the Table"; idiomatically, "The Inspector Spills the Beans", or "The Inspector Lays It All on the Table"). Rémy's employment was terminated in December 2003 when he informed Michelin of his plans to publish his book. He brought a court case for unfair dismissal, which was unsuccessful. Rémy described the French Michelin inspector's life as lonely, underpaid drudgery, driving around France for weeks on end, dining alone, under intense pressure to file detailed reports on strict deadlines. He maintained that the guide had become lax in its standards. Though Michelin states that its inspectors visited all 4,000 reviewed restaurants in France every 18 months, and all starred restaurants several times a year, Rémy said only about one visit every 3½ years was possible because there were only 11 inspectors in France when he was hired, rather than the 50 or more hinted by Michelin. That number, he said, had shrunk to five by the time he was fired in December 2003. Rémy also accused the guide of favoritism. He alleged that Michelin treated famous and influential chefs, such as Paul Bocuse and Alain Ducasse, as "untouchable" and not subject to the same rigorous standards as lesser-known chefs. Michelin denied Rémy's charges, but refused to say how many inspectors it actually employed in France. In response to Rémy's statement that certain three-star chefs were sacrosanct, Michelin said, "There would be little sense in saying a restaurant was worth three stars if it weren't true, if for no other reason than that the customer would write and tell us." Some non-French food critics have alleged that the rating system is biased in favor of French cuisine or French dining standards. In the UK The Guardian commented in 1997 that "some people maintain the guide's principal purpose is as a tool of Gallic cultural imperialism". When Michelin published its first New York City Red Guide in 2005 Steven Kurutz of The New York Times noted that Danny Meyer's Union Square Cafe, a restaurant rated highly by The New York Times, Zagat Survey, and other prominent guides, received a no star-rating from Michelin (he did, however, acknowledge that the restaurant received positive mention for its ambiance, and that two other restaurants owned by Meyer received stars). Kurutz also claimed the guide appeared to favor restaurants that "emphasized formality and presentation" rather than a "casual approach to fine dining". He also claimed that over half of the restaurants that received one or two stars "could be considered French". The Michelin Guide New York 2007 included 526 restaurants, compared to 2,014 in Zagat New York 2007; after The Four Seasons Restaurant received no stars in that edition, co-owner Julian Niccolini said Michelin "should stay in France, and they should keep their guide there". The 2007 guide does, however, include menus, recipes, and photographs, and description of the atmosphere of starred restaurants. In 2010 Michelin guides ranked Japan as the country with the most starred restaurants. This sparked questioning over whether these high ratings were merited for Japanese restaurants, or whether the Michelin guide was too generous in giving out stars to gain an acceptance with Japanese customers and to enable the parent tire-selling company to market itself in Japan. The Wall Street Journal reported in 2010 that some Japanese chefs were surprised at receiving a star, and were reluctant to accept one, because the publicity caused an unmanageable jump in booking, affecting their ability to serve their traditional customers without lowering their quality. 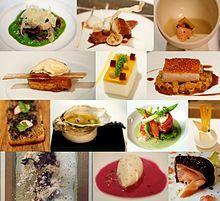 Casa Julio (Fontanars dels Alforins, Spain): After receiving a star for a perfumed cuisine in 2009, the restaurant chef Julio Biosca felt the award was granted to dishes that he did not like and restricted his creativity, and tried to remove his star and in December 2013, discontinued his tasting menu. The removal took place in the 2015 guide. Petersham Nurseries Café (London): After receiving a star in 2011, founder and chef Skye Gyngell received complaints from customers expecting formal dining, leading to her attempt to remove the star, and subsequent retirement from the restaurant. She has now said she regrets her remarks and would welcome a star. 't Huis van Lede (Belgium): After receiving a star in 2014, chef Frederick Dhooge said he did not want his Michelin star or his points in the Gault-Millau restaurant guide because some customers were not interested in simple food from a Michelin-starred restaurant. In 2017, the Bouche à Oreille café in Bourges was accidentally given a star when it was confused with a restaurant of the same name in Boutervilliers, near Paris. ^ Wertenbaker, Charles (5 June 1954). "The Testing of M. Thuilier". The New Yorker. Retrieved 1 July 2016. ^ a b c "Michelin Guide History" Archived 4 March 2016 at the Wayback Machine, Provence and Beyond, accessed 19 May 2013. ^ a b (in French) "Achetez en ligne votre Guide Michelin Europe Archived 7 February 2016 at the Wayback Machine", Michelin. ^ "Michelin Guide - Yannic Alleno's 1947 restaurant (Courchevel) awarded 3 stars in the 2017 Michelin Guide France". www.michelin.com. 9 February 2017. ^ "Michelin Unveils France's Bib Gourmands for 2017". Eater. Retrieved 27 October 2017. ^ "Michelin Group: news from the tyre and mobility leader". michelin.com. ^ "Les publications Michelin pour les investisseurs institutionnels" (PDF). michelin.com. ^ "All Current UK and Ireland Michelin Star Restaurants". 2 October 2018. Retrieved 2 October 2018. ^ "Michelin Group: news from the tyre and mobility leader - Michelin". michelin.com. ^ "Michelin Star Restaurants 2014 / 2015 - dinnersite.nl restaurant guide". dinnersite.nl. Archived from the original on 27 June 2012. Retrieved 23 August 2012. ^ "Michelin Guide Netherlands 2011", Michelin, 26 November 2010. ^ "MICHELIN Guide Nordic Countries 2019 Selection". michelin.com. 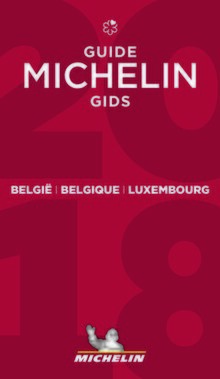 ^ (in Spanish) "Guía Michelin 2018". Retrieved 7 December 2017. ^ "Lista Bib Gourmand 2018". ^ "Guide Michelin: 2 Sterne für Mahler & Eperon | GaultMillau – Channel". Gault Millau (in German). Retrieved 5 February 2019. ^ "Michelin Stars Rain Down on Switzerland", Michelin, 16 November 2010. ^ " "The Michelin Guide France 2010 Selection". Michelin North America. 1 March 2010. Archived from the original on 31 October 2010. ^ "Michelin awards two stars to Smyth; 24 other Chicago restaurants honored". chicagotribune.com. ^ Vettel, Phil. "Michelin's Bib Gourmand awards go to 54 Chicago restaurants, with 8 newcomers". Chicagotribune.com. Retrieved 17 June 2018. ^ "Michelin Guide Chicago 2015 - Michelin Travel & Lifestyle". michelintravel.com. ^ "Discover Michelin Restaurants in Hong Kong Macau Hong Kong Macau". guide.michelin.com. ^ (in Japanese) "https://guide.michelin.com/hk/en/hong-kong-macau/bib-gourmand/restaurants", Michelin Hong Kong and Macau, 18 December 2018. ^ "Michelin news: all recent news from the Group - Michelin" (PDF). michelin.com.au. Archived from the original (PDF) on 23 March 2012. Retrieved 2 February 2016. ^ (in Japanese) ”「ミシュランガイド京都・大阪・神戸2011」12 軒のレストランが三つ星 44軒のレストランと2軒の旅館 が二つ星 183軒のレストランと2軒の旅館が一つ星”, Michelin Japan, 19 October 2010. ^ Jinae West "Michelin: Bad economy means no 2010 guide in Las Vegas, Las Vegas Sun, 26 June 2009. ^ "Restaurants go for Gold as 2012 Michelin Stars are announced". londonandpartners.com. ^ Phil Vettel "And the crystal ball says …", Michelin North America, 16 November 2010. ^ a b "Michelin Releases 2017 Edition of Its Famed Guide to New York's Best Restaurants". ^ "Michelin Guide to Brazil 2018 – the Full List". Fine Dining Lovers. Retrieved 24 August 2018. ^ Flores, Magê (18 May 2017). "8 casas boas e baratas do Rio e de SP ganham menção no Guia Michelin". Folha de S. Paulo. Retrieved 1 March 2018. ^ a b c "Michelin Awards Coveted Three Stars to Quince in 2017 Edition of Famed San Francisco Restaurant Guide". ^ MICHELIN Guide Shanghai 2019 Selection, September 19, 2018. ^ 34 Restaurants Awarded Michelin Stars in 2019 Shanghai Guide, September 20, 2018. ^ "Singapore restaurant stalwarts, Australian and Italian cuisine celebrated in the 2017 MICHELIN guide Singapore", Michelin Guide Singapore, 29 June 2017. ^ "The Results: Bib Gourmand Awards For The 2017 MICHELIN guide Singapore", Michelin Guide Singapore, 22 June 2017. ^ (in Japanese) "「ミシュランガイド東京・横浜・鎌倉2011」を発行　三つ星が14軒、二つ星が54軒、一つ星が198軒に", Michelin Japan, 24 November 2010. ^ "Michelin Releases Its Bib Gourmand List for DC", Washingtonian, 16 October 2016. ^ "Discover Michelin Restaurants in Taipei Taipei". guide.michelin.com. Retrieved 10 April 2019. ^ "Results: The Inaugural MICHELIN Guide Guangzhou Released". guide.michelin.com. Retrieved 28 June 2018. ^ "Four Clare pubs listed in 2014 Michelin Guide". Clare Champion. 19 May 2014. Archived from the original on 8 September 2015. Retrieved 4 January 2016. ^ Adam H. Callaghan (5 November 2015). "Michelin Recognizes Street Food for the First Time in Its Hong Kong Guide". Eater. Retrieved 2 February 2016. ^ "Michelin includes street food for first time in Hong Kong guide". The Guardian. Retrieved 2 February 2016. ^ Kim, Soo (25 July 2016). "Singapore street food stalls get Michelin stars". The Daily Telegraph. Retrieved 8 August 2016. ^ a b Ferguson, Priscilla Parkhurst (1 February 2008). "Michelin in America". Gastronomica: The Journal of Critical Food Studies. 8 (1): 49–55. doi:10.1525/gfc.2008.8.1.49. ISSN 1529-3262. ^ a b Ian Mount (11 December 2014). "The curse of the Michelin-star restaurant rating". Fortune. Retrieved 2 February 2016. ^ "The chef who gave up his Michelin star". El País. 2 December 2014. Retrieved 2 February 2016. ^ "Skye Gyngell: curse of the Michelin star has driven me out of the kitchen". The Daily Telegraph. 21 February 2012. Retrieved 2 February 2016. ^ "摘星變詛咒　難耐食客投訴不絕 女廚棄米芝蓮榮耀 - 蘋果日報 - 兩岸國際 - 20120222". Apple Daily 蘋果日報. Retrieved 2 February 2016. ^ Hillary Dixler (13 March 2014). "Chef in Belgium Gives Back His Michelin Star". Eater. Retrieved 2 February 2016. ^ "Workmen's cafe overwhelmed with customers after it is accidentally awarded a Michelin star". The Daily Telegraph. 18 February 2017. Retrieved 18 February 2017. ^ "Quand un bistrot de quartier reçoit par erreur une étoile au Michelin". Konbini. 17 February 2017. Retrieved 20 February 2017. This page was last edited on 20 April 2019, at 08:29 (UTC).